Although cloud computing could result in significant cost savings for HHS, the department has allocated just 1% of its overall budget to such services, according to a new Government Accountability Office report, Health Data Management reports. For the report, GAO examined the cloud computing services of seven federal agencies, including HHS. The report compared the status of such services in fiscal year 2014 budgets with its previous report in 2012, about three years after the Office of Management and Budget issued the federal Cloud First policy, which requires agencies and departments to implement cloud-based services whenever there is a cost-effective, reliable and secure opportunity to do so. •Increased its spending on cloud computing services from $26 million in FY 2012 to $64 million in FY 2014, which corresponded to an increase from 0% of its IT budget to 1% of its IT budget. However, the report found that only four of HHS’ 36 current cloud computing services reduced costs, for a total savings of $1,190,000. •In some cases, such services created an additional service or improved quality of service, which created added costs that offset any savings. •Establish timelines for IT investments that have not been evaluated for migration to cloud computing services. HHS said it agreed with the recommendations (GAO report, September 2014). Technology has enabled major breakthroughs in medicine in recent years. Scientists can grow body parts in petri dishes, surgeons can operate via robot, and an individual genome can be mapped for just a few thousand dollars. But with electronic medical records, a crucial piece of health care reform going forward, doctors are still waiting for the technology to deliver on its promises. Meanwhile, they face penalties if they do not adequately implement electronic systems. Electronic medical records, called EMR for short, were hyped as a solution to inefficiencies in processing patients through medical situations as well as safety concerns. No more worrying about interpreting doctors’ chicken-scratch handwriting with electronic prescriptions. Doctors would be able to predict which patients were at risk for conditions like diabetes by analyzing medical history amid vast new stores of data. Patients and their providers would have access to the appropriate records in an emergency room, a doctor’s office or a hospital. Instead, at least in Yakima, many doctors are frustrated by interfaces that don’t allow them to input or receive information the way they want, which slows them down. Part of the problem is the transition. Most doctors today are still used to paper charts, or at least dictating notes to be transcribed later. Many are poor typists. They’re used to writing patient notes in sentences, not scrolling through endless lists to click boxes on a screen for each complaint and symptom. Schaffrinna has been involved with electronic medical records in some form for the past 24 years with different organizations. The real push toward electronic medical records came in 2009 with the federal HITECH Act, which includes incentives for providers to employ EMR systems that meet certain “meaningful use” requirements. In other words, it’s not enough to simply install an EMR system; it has to improve results for patients and collect relevant data. “There is both a carrot and a stick incentive structure,” says Ian Corbridge, the new policy director for clinical issues at the Washington State Hospital Association. He comes to the organization after working on quality metrics and meaningful use in the Health Resources and Services Administration, part of the federal Department of Health and Human Services. 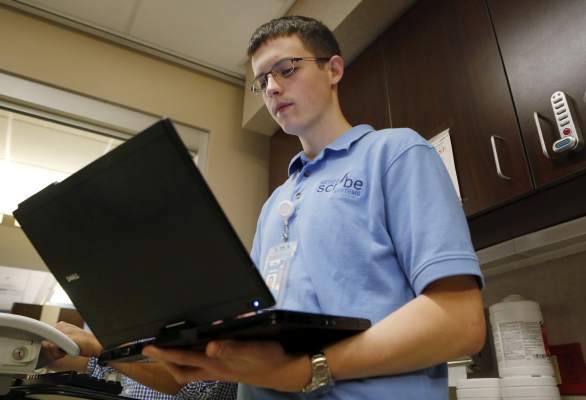 The carrot side, Corbridge said, is federal financial support to providers who implement EMR. But that support is by no means sufficient to cover the exorbitant cost of implementation, nor was it meant to be. For a small organization, Schaffrinna says, the patient portal alone costs $100,000; the cost of the entire EMR, including hardware and software, can be in the millions or tens of millions depending on the size of the organization. Starting in January, however, the carrot becomes more of a stick because financial penalties kick in for providers who have not met specific “meaningful use” benchmarks, Corbridge said. The penalty is a 1 percent reduction in Medicare reimbursement rates each year. Meaningful use requirements — think improved patient results and data collection — are set in stages, so once providers are up to snuff on certain measures, they are then required to address the next tier. Stage 1 includes providers ordering medications electronically, logging certain patient information such as allergies and vital signs electronically, and using EMR to check for drug interactions, among many others. Stage 2 includes many of the same measures, then adds more: generating lists of patients with specific conditions to compare for quality improvement; using the EMR to identify patients who need reminders for follow-up treatment; and communicating with patients electronically about health issues, to name a few. At Yakima Valley Memorial Hospital, physicians are meeting “pretty much all” of the 22 Stage 2 benchmarks set by the Center for Medicare and Medicaid Services, said Jeff Yamada, vice president and chief information officer. The list includes using EMR to order medications and lab studies, patient access to their medical record prior to discharge and the availability of images to physicians, among many others. “Currently, we look very good to be able to attest for meaningful use Stage 2, which we’ll do Oct. 1,” Yamada said. If Memorial doesn’t make it, he said, the hospital could lose the financial incentive payments, and after that, face penalties. The incentive payments and the financial penalties are a big deal, providers say, because the cost of EMR is so high. Some smaller hospitals and providers around the country are affiliating just to share in the cost of implementation. Schaffrinna sees the financial penalty as a double-whammy, considering how problematic Community Health’s EMR system has been so far. Experts acknowledge that doctors see a significant drop in productivity during implementation of an EMR system and for the next six or eight months, at least, as they become accustomed to the digital format. The unfortunate reality, he said, is that “these systems force people to bend to the system rather than having the system bend to the workflow or the people,” in part because the EMR systems available today are not designed by physicians currently working with patients. That hurts the bottom line, both because of lost patient time as providers struggle to complete the electronic records quickly, and because organizations often have to hire extra information technology staff members to keep the system running. Ease of EMR implementation depends a lot on the system, too, and almost every organization in the Yakima Valley is on a different system. That wasn’t always the case. Yakima was far ahead of the curve when local physician Dr. Victor Sharpe and technology developer Greg Jewell created ChartConnect in 2000. Many providers used the system, so everyone could share patient information. 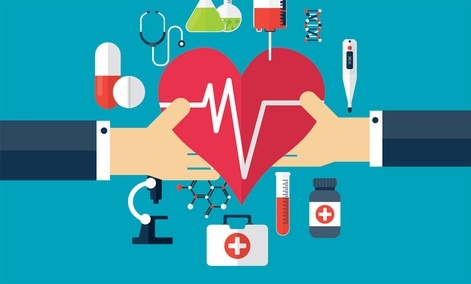 But with the requirements of the HITECH Act, providers found that ChartConnect did not suit their evolving needs and chose new systems more specifically tailored to their practice. One technology still promised for the future: “health information exchanges,” not to be confused with the state insurance exchanges. These new electronic exchanges will allow different systems to talk to each other, and with that hopefully comes sharing of patient information when medically necessary, eliminating redundant procedures (and forms for patients) and lowering the risk that crucial data slips through the cracks between multiple providers. At Yakima Regional Medical and Cardiac Center, hospitalist program director Dr. Mark Silverstein says the system implemented under previous owner Health Management Associates works well. (HMA was bought earlier this year by Community Health Systems.) But he doesn’t bring a computer into the exam room; he enters notes at computer stations after he talks with patients. Doing the data entry with the patient present would detract from the personal interaction, he says. And medical staff still take some paper notes, though that will eventually be phased out. Dr. Carl Olden, a practitioner at Memorial’s Pacific Crest Family Medicine, sees a lot of good in EMR, too. The efficiencies inherent in the technology — reviewing lab work in real time, prescriptions sent to the pharmacy automatically — can enhance patient relationships and improve care, he said — if they work as intended. “But it takes more work to do that,” Olden said. • Molly Rosbach can be reached at 509-577-7728 or mrosbach@yakimaherald.com. The Department of Veterans Affairs plans to outsource issuance and administration of the “Veteran’s Choice Card,” a key provision of legislation signed last month by President Barack Obama that allows veterans to seek health care from private providers outside the Veterans Health Administration network of 950-plus hospitals and clinics. In contracting documents, VA said a third-party administrator will manage the creation and distribution of the Veteran’s Choice Card, which vets can use to obtain services from private sector clinicians and hospitals as called for in the Veterans Access, Choice and Accountability Act of 2014. VA said the third-party administrator will also set up a call center to provide education to veterans and providers on program details and respond to veteran and clinician inquiries. The call center will track, monitor and provide reports on veteran use of private health care and manage claims adjudication and payment. The legislation allows veterans who live more than 40 miles from a VA health facility to seek private care. The choice card database will use that metric to determine whether the veteran can access private care. The database will also estimate the costs of outside care and collect and verify information on other types of health insurance used by veterans. On Wednesday, VA will hold an industry day to obtain insights on the project at its Denver Acquisition and Logistic Center, which performs supply chain management for VA and other government agencies. Remember that Boston Globe story from July that questioned the safety and efficacy of electronic health records? If you haven’t seen it, I recommend that you check it out, but take a grain of salt with it, since the story neglects to say that the savings and quality gains promised with the $27 billion Meaningful Use EHR incentive program aren’t supposed to be realized until Stage 3, which won’t start before 2017. I had a chance to talk to Koppel recently for an article in another publication that should appear shortly after Labor Day. I left out a long discussion we had about a public hearing held while federal officials were in the early stages of development for Meaningful Use Stage 2 requirements, but I’m going to share that here. Koppel recalled an April 2011 hearing on EHR usability in front of the Health IT Policy Committee‘s workgroup on certification and adoption, a workgroup that included several vendor executives. He was on a panel with University of Maryland computer scientist Ben Shneiderman, an expert in user interfaces. Of particular concern is the lack of standardization of terminology, something that remains a problem today. Shneiderman related the story about a physician who got a report saying that a patient had Congolese hemorrhagic fever (sometimes called Crimean-Congo hemorrhagic fever). But the patient didn’t really have that deadly disease. The diagnosis had been improperly coded by someone who didn’t recognize the abbreviation “CHF,” which also stands for congestive heart failure, a common, chronic, treatable condition. According to Koppel, vendor representatives essentially argued that usability was not measurable because it was too theoretical. Carl Dvorak, he celebrates the diversity and the product differentiation of competing products, but they’re differentiating on the wrong metrics. If they differentiated on the support of creative diagnostics, I’d be very impressed. But to differentiate by the color of the fonts and last name/first name versus first name/last name and the 35 ways that systolic and diastolic pressure are shown is not creativity. It’s not freedom. It’s just chaos,” Shneiderman said. Vendors voluntarily report findings on adverse events to the Food and Drug Administration’s Manufacturer and User Facility Device Experience (MAUDE) reporting system. While the reports are made public, they are made anonymously, which frustrates Koppel. “It’s completely voluntary, but completely secret,” Koppel said. For their part, vendors said insurance companies were partly to blame because they make it hard to access key cost data. ” For example, we heard complaints [at the hearing] about too many clicks to order a mammogram. That may have been bad software design, but it may have been that in that particular case, the payer was putting up a hurdle in front of ordering the mammogram by asking for additional data with an overt intention of discouraging the use of what might have been judged to be an inappropriate test,” Dr. David McCallie, vice president of medical informatics at Cerner CERN -0.43% Corp., said at that 2011 hearing. “We tried to design an e-prescribing system a few years ago, and one of my goals to the team was to surface to actual cost to the patient out of pocket of the medicines so that the physician could give the patient choices between the various—once a day is going to cost you more than two times a day. We couldn’t get that data; it’s hidden from us. The payers wouldn’t let us get it, so we had to build cumbersomeness into the user interface that, in fact, reflected external constraints,” McCallie said. There has been more talk lately of price transparency, and more collaboration between payers and providers on making cost data more accessible, but the three-way blame game among payers, providers and vendors continues to this day. Among the losers are taxpayers who are ponying up billions for health IT that so far has been more helpful than harmful, but hardly ideal. But the real losers here are patients, whose safety continues to be at risk. When Micky Tripathi and David McCallie deliver their draft recommendations to the Health IT Policy Committee today, they’ll have some pointed things to say about the JASON report, and its ideas about the state of nationwide interoperability. Tripathi, CEO of the Massachusetts eHealth Collaborative, and McCallie, senior vice president of medical informatics at Cerner, are co-chairs of the joint HIT Policy and Standards Committee’s JASON Task Force – charged with digesting the report, “A Robust Health Data Infrastructure,” prepared for AHRQ by the MITRE Corporation’s JASON advisory group, and making suggestions to ONC about what to do with its findings. In a presentation made to their own JASON Task Force on Sept. 2, Tripathi and McCallie offered their perspective about the dense, 69-page report, which assesses the U.S. healthcare’s readiness for widespread and seamless data exchange. How ready? JASON’s verdict: not very. It refers to the “need for resolving patient identities across implementations as a key barrier to data aggregation,” but doesn’t offer any new ideas for fixing that notoriously thorny issue. “We believe that JASON seriously underestimates the progress made in interoperability, though we agree that there is considerable room for improvement,” they argue. The JASON report “explicitly focuses only on high-level technical architecture and does not address legal, business, policy, federation issues,” they write. That’s a pretty small-bore lens through which to view this big challenge, says Tripathi, who spoke about the systemic ways interoperability has historically been hampered in the U.S. – understandable, if not excusable – and how those barriers, one by one, look to be falling. The first small-scale Massachusetts eHealth Collaborative HIE pilots kicked off 10 years ago, in 2004. Where are we now, compared to where you thought we’d be then? Or here’s a shorter question: Why is interoperability so hard? Up until now there hasn’t been enough demand for interoperability in healthcare. Lack of demand has been a big part of it. A lot of people have the perspective that there has been a negative motivation behind that: people wanting to horde their data and not share it with others because they think they’re going to harvest their most profitable patients, and what have you. I’m sure there’s some of that. But I think there’s a genuine lack of demand for a variety of other reasons. There’s a financial aspect to it as well, which is just the fee-for-service model. It may be true that some people, if they’re being paid just to do stuff are going to do it, whether it’s needed or not. I’m sure there are certain bad actors who act that way. But I think it’s more a question of investment, and need: If I’m paid just to do more stuff I can try to figure out how to invest in a complex system that I don’t have a lot of control over to try to figure out whether that X-ray was actually done somewhere else in the past six months, and thereby save the system money, or I can just do the X-ray and keep going with the quality care I want to give here. They’re just choosing the path of least resistance. The other thing I would add is the fragmentation of the industry. If you think about how other industries – almost every other industry in the U.S. – the Department of Commerce does industry concentration numbers, and if you look at what percent of the industry accounts for X percent of all the activity that happens in that industry, and it gives you a measure of its concentration. And it turns out that healthcare, both the demand side – meaning patients and purchasers, like health plans and employers – are very fragmented. And then on the supply side – providers, first and foremost, and hospitals – they’re extremely fragmented as well. And what that means is the demand that happens in other industries, through the market itself, where you get standardization through consolidation – look at the airline industry, where American in the 1970s developed the Sabre system for reservations and very quickly, because there are relatively few players in the airline industry looked at that and thought, wow, I want to use that too and don’t want to invest in my own, so why don’t I use it and I’ll pay American Airlines for it. Pretty soon you have people coalescing around something, and all it takes is five or 10 organizations to do that. In retail marketing, when Target and Walmart start to get huge and using IT as a strategic lever, all of a sudden you start to see the industry and supply chains start to coalesce around the standards that they create because they’re so big. In healthcare, no one’s that big. You might think, well, Aetna’s really big. Well, they’re big nationally, but they’re relatively small in any market. So it’s not like what Aetna does can drive the entire market the way that Walmart does can drive the entire retail department store industry. Similarly on the supply side, the Mayo Clinic is really big, but they’re pretty small in any market. They’re big in Minnesota, but when you start to look at other places, OK, there’s a Mayo Clinic in Chicago, but they’re 10 percent of all the providers in Chicago or something like that. That’s where you start to have the fragmentation. So if you’re looking for a model that’s happening in other markets, where you say, if 10 companies got together and agreed on a set of standards – this also happened in banking with ATM transactions and stuff, if 10 companies got together and decide on a set of things, and it covers 70 percent of the market, the other 30 percent will follow along. We don’t have that in healthcare. If you wanted to get the set of provider organizations that account for 50 percent of all patient transactions, there are hundreds and hundreds of organizations it would take. That’s a market impediment. But I think that dynamic has changed. Meaningful use was obviously a big driver in changing that. To me, the one market player that’s the counterexample to everything I was just saying is Medicare and Medicaid. Leave aside that they happen to be owned by the government – they’re big health insurers, and they’re the only ones who are big enough to move the market. That’s true for ICD-10, it’s true for CPT codes, it’s true for every other thing in healthcare. Medicare and Medicaid tend to be huge drivers because they’re so big in the market, not because they’re the government, necessarily. And so when they started to embark on MU, and said, when you start doing this stuff, we’ll give you an incentive to do it, they like Walmart are so big in the industry that all of a sudden it started to move the industry in a new direction. That was the incentive to change the way people start thinking about this. Everyone starts to have EHRs, which is essential to interoperability: You can’t talk on telephones if everyone doesn’t have a telephone. Meaningful use Stage 1 completely changed that. Within a span of three to four years you (go from) 10-15 percent of physicians on EHRs to approaching 70 percent of them having EHRs. Accountable care is starting to create this culture where, if you do that extra MRI, the ACO is going to be on your back saying, ‘Wait a minute, that was actually available in one of our partner hospitals, and you should have known that before ordering that expensive test. From my perspective there are some cultural dynamics that are pretty powerful going on as well. The next generation of physicians are all on iPhones and streaming Spotify and on Snapchat. Increasingly when I talk to them they have an expectation that this is about to happen. And they’re increasingly unwilling to go into settings that aren’t having something that at least has a glimmer of Facebook-like personality and interoperability. They appreciate that there are privacy and security concerns that prevent a complete Facebook openness, but there’s an expectation on the provider side. It just takes time for the older generation to leave and the newer generation to come in. I think they’re starting to make their voices heard from the bottom up. It’s happening on the patient side, too. It takes a while, but increasingly we’re seeing – and maybe this is a bit ahead of the pack, but I don’t know how much – your expectation that you can get on websites and make reservations and do other stuff but not be able to do that in healthcare, there seems to be increasing demand for that. Maybe we should take some satisfaction of where we are today, then. When you were doing those initial pilots in Newburyport and Brockton in 2004, did you envision we’d be where we are today? I think the HIE story is a really good story now. Not because we’ve accomplished more. If I look back on my 2004 self, I would have thought that in 10 years we’d be further along than we are now. On the other hand, I guess I feel really good about it because I think a lot of what happened, especially with the HITECH dollars – and our pilot project showed this too, but that was just a microcosm or a harbinger or what the national experience was later – is that this isn’t a money problem or a technology problem. If you give people money – we had $50 million for our pilot projects, CMS giving $25 to $30 billion – we can throw money at it, buy technology for people, put it in their offices, and then find that they still don’t do it because there are so many barriers to it: cultural, legal, policy barriers – and workflow barriers. If you look at how innovation happens in any industry, it often starts with product innovation, where people have fancy, cool new toys that get put out in the market. But there’s been a lag: a bump up in product innovation – and then there’s this real lull because process innovation has to take over to really incorporate those new products. We’re seeing that in healthcare. We have the capability for Direct messaging now, but it still doesn’t work to the satisfaction of most people. It’s not because the technology isn’t in front of them, it’s because the market ecosystem, which is about process innovation, hasn’t fully developed to create that ability for networks to talk to each other. Telephone networks and power grids, same sort of challenges. Now we’re just at the beginning of the market trying to figure out how to put these pieces together. The pieces are all distributed – and that’s a good thing – but it takes a while now to figure out how to put all this together. Even in these places where Direct is working, like the Massachusetts state HIE has hundreds of thousands of transactions a month, one of the things we’re finding is that people are comfortable being senders – I have my secure email and I’m happy to send. Part of that is because MU is incenting you to send, with the 10 percent transition of care summary, but they also feel comfortable sending. What organizations are not comfortable with doing is receiving the information. They don’t know what to do with it when it comes through that channel because they’re so used to getting it via fax. Mass General has literally thousands of providers with all these processes designed to protect patients from safety events and deliver good care. It’s not easy to say to all those people, ‘We’re going to flip over to email, starting tomorrow.’ They have a lot of finely crafted – and arcane – but yes, finely crafted processes that track information in certain ways. Direct was billed as a relatively simple solution, but is so much harder in practice than many people might have thought. Are you surprised? Yeah, I am. And maybe I’m just admitting my own naïveté here. But yeah, whenever we start to make this kind of change I think it’s generally true that we probably under-appreciate the complexity of what seem to be small changes. Because the industry is so fragmented, it’s hard to get that kind of coordination. If there was just a Walmart and a Target that accounted for 60 percent of all of healthcare, things would be a lot easier. You could get Walmart and Target to talk to each other via Direct, and then the other 40 percent would come along. But it’s so fragmented that the networks are emerging organically and there are literally hundreds of them. Trying to figure out how they fit together is part of the challenge. I was studying the telephone industry. At the turn of the last century there were something like 2,000 telephone networks in the U.S. alone. It took decades for them to come together so you could have seamless hubs across the networks. There were lots of local exchanges, but long-distance – one exchange to another – took a while to figure out. It’s the same thing here. ONC is going to hopefully play a much bigger role here trying to facilitate that. But if it’s not coming from at least strong parts of the market, it’s not like the government can do anything that will be long lasting. In our economy it’s gotta be market-based, at the end of the day. The other example I would give is look at the one area of healthcare where there is concentration: namely, pharmacies. And interoperability works great there. E-prescribing is the runaway success of interoperability. How did that happen? Well, basically, the retail pharmacies formed an oligopoly. You have Walgreen’s, CVS, Rite-Aid and Duane Read and a few others. It’s fewer than 10 retail pharmacies and fewer than 10 PBMs and that accounted for the vast majority of the prescribing market. They get together and say, We’re going to create a network among ourselves. It will be a proprietary network, and it’s a runaway success. It’s now the national standard for how prescribing happens. I’m not advocating monopoly (laughs), but sometimes there’s a benefit to that. It’s the one place in healthcare where it did happen, on its own, without the government having to get involved. What is the mandate of the the JASON task force? The JASON Report was inspired by a couple things. Well, there are two pieces to it: what was the original question that was asked of them, and what was their motivation as they started to look at it. The JASON process is sort of highly-structured. And somewhat, I don’t want to say secretive, but designed to bring together experts where the individuals aren’t identified. It’s not like I, or David McCallie, who’s co-chair of the JASON task force, have conversations with individuals who contributed to the report. We literally don’t know who those individuals are. But the original question that was asked of them by the federal government was really to look at the ability for health information exchange to contribute to a platform or platforms to be able to do better research, to improve healthcare. It was very focused, the original question was focused on that: If it can help with clinical care, great, but it was really focused on this question of how can it help to enable research. But then, I think, if you read the report, you see one of the things they look at and are struck by, which I think most people would agree with, is that, jeez, interoperability really isn’t very far along. It’s really not where any of us really hoped it would be. I think that that’s an observation that resonates with people: Its unsatisfactory, in many ways, where we are right now. So they came up with a proposed architecture and proposed approach for thinking about how one might enable a way for a nationwide approach, to have an ability to aggregate and normalize information, such that it can be used for clinical care, used for research, and used in a better way by patients to manage their own care. So that’s roughly what the JASON report was about and the solution they proposed. We’ve got the task force now that is looking at it, and we’re still in the middle of our deliberation, but I think one of the things we’ve talked about on the public workgroup calls is a sense that, in terms of the overall perspective of the JASON authors that, ‘Yeah, we’re not as far along as we’d like to be. There’s is a sense, though that there’s probably more progress in various types of health information exchange than the JASON authors seem to give credit for. Some of that may have to do with timing. They were asked to start on this almost two years ago. There’s a long lag in the process – they put together the committee and embark on their investigation and they issue their report and the government approves the report, then decide to release it. They started thinking about this two years ago, and only now are we seeing the report. So it may be that they didn’t have the opportunity, because a lot has happened over the past two years, to be able to accurately reflect the current status. So I think there’s more progress than they give credit for. Where are some of these pockets of success? If you look a the Massachusetts statewide HIE, which had hundreds of thousands of transactions a month, among providers sending to quality data warehouses like ours and others, that’s growing every month. And providers pay for those services. If you go into Rochester or Albany, or Indianapolis, or Cincinnati, there are, alive and well, health information exchange organizations where people are actually doing the things the JASON authors would like us to do as a country. They didn’t seem to give credit to places where that was actually going on. We want something across the country, and to be available nationwide. Which they properly point out has not happened. And, I think, they properly point out that there is no top-down roadmap. And they’re trying to suggest a bit of how to do that. So as we dive into it more, we’re now in the middle of taking a lot of comments, we’ve had a lot of listening sessions and a wide variety of perspectives on the current state of interoperability. I think one of the challenges as we think about the JASON approach is how do we take what they seem to be recommending – as I said, the authors are anonymous and there’s no opportunity to go and ask them questions, and the report is relatively short, although very well-written and concise – but in something as complex as this, we don’t have the opportunity to go back and ask, “What did you mean by this, it’s not clear.’ You just have to interpret what you get from that. But I think there is something of a question: it seems to suggest a single architecture for the entire country, and I don’t think that’s something that was in the minds of the JASON authors. As we look at a country as complex and heterogeneous as ours, it’s clear that there is no single solution that will work in Arizona and in Massachusetts. Those are going to be perhaps different types of architectures, perhaps different types of exchange activities that happen within those markets. And I shouldn’t even draw it on state boundaries, because healthcare spills across borders, but in different parts of the country you’re going to see different things happening. So that’s one challenge, to figure out how to interpret what seems to be a single architecture in a very complex economy that probably can’t have a single architecture like that. But a lot of the challenges we’ve seen in interoperability haven’t been about the technology. They’ve been about all these other things. To the point that the JASON report focused on the technology piece of things, that’s great, and there’s probably some valuable pieces to that, but if you consciously don’t address things that a number of us would probably say are very important pieces, you’re only getting more of the story. So your role is to digest all this and then recommend to ONC what sort of strategy they should take in implementing their suggestions. The JASON report had some specific recommendations for ONC. There’s a long list of them. We’ll sort of take the structure of having some comments on their observations, just to make sure we have a sense of, here is their empirical view of the world, and do we agree with that? We want to make sure we say, if there’s any disagreement we have as a task force, with some of their empirical observations, let’s make those clear. And as I said, we think there are some places where they didn’t give enough credit to what is going on. Those are the kinds of things we may want to point out. And then in the recommendations, we’ll go down and have comments on a number of the recommendations. Some we’ll agree with, some we’ll disagree with, some we’ll remain silent on. And then there are some recommendations that are specific to ONC: that within 12 months ONC should come up with a blueprint for the JASON architecture. Those are the types of things we might provide a little advice on the feasibility of that. After we brief the policy and the standards committees (this week and next) there will be a joint meeting of the policy and the standards committees and we’ll be making our final recommendations at that meeting.